TUCSON, Ariz. (AP) — Gabrielle Giffords limped to the front of the courtroom and stared silently Thursday as she came face-to-face for the first time with the man who tried to kill her. The former congresswoman hadn't been near Jared Lee Loughner since the deadly rampage outside a meet-and-greet at a supermarket that killed six people and left her partially blind, with a paralyzed right arm and brain injury. Giffords' astronaut husband told Loughner what Giffords couldn't, before he was sentenced to seven life terms for the January 2011 slayings and attempted assassination of a member of Congress. "Mr. Loughner, you may have put a bullet through her head, but you haven't put a dent in her spirit and her commitment to make the world a better place," Mark Kelly said. Giffords, wearing a black brace around her torso, looked closely at the 24-year-old Loughner for several minutes without uttering a word. Loughner returned their gaze, but showed no emotion. His mother sobbed nearby. Loughner was then ordered to serve the seven consecutive life sentences, plus 140 years in federal prison for the shootings that killed six people and wounded 13, including Giffords, as she met with constituents in a Tucson shopping plaza. His guilty plea enables him to avoid a federal death sentence. No state charges will be filed. The sentencing marked the end of a nearly two-year-long saga in which Loughner, who has schizophrenia, was forcibly medicated at a Missouri prison medical facility so he can be competent to understand the charges against him. U.S. District Judge Larry Burns recommended Thursday that he remain there indefinitely. 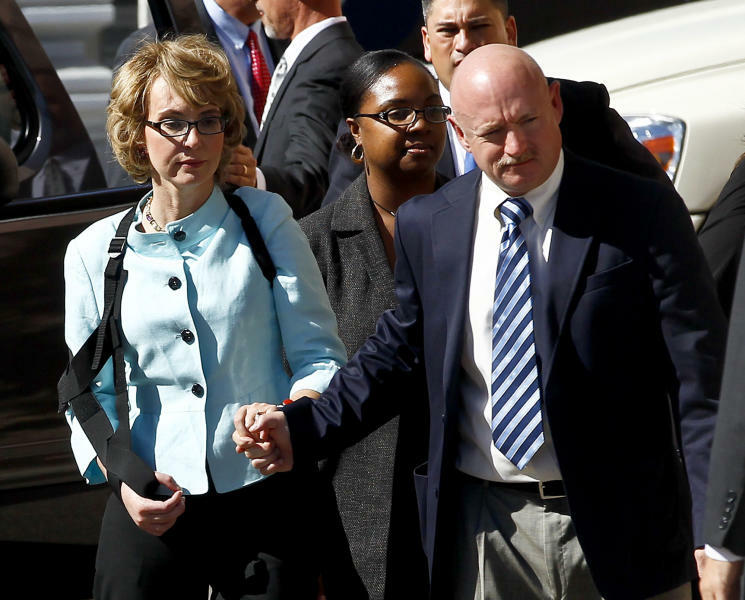 Some victims, including Giffords, welcomed the plea deal as a way to move on. It spared victims and their families from having to go through a potentially lengthy and traumatic trial and locks Loughner up for life. 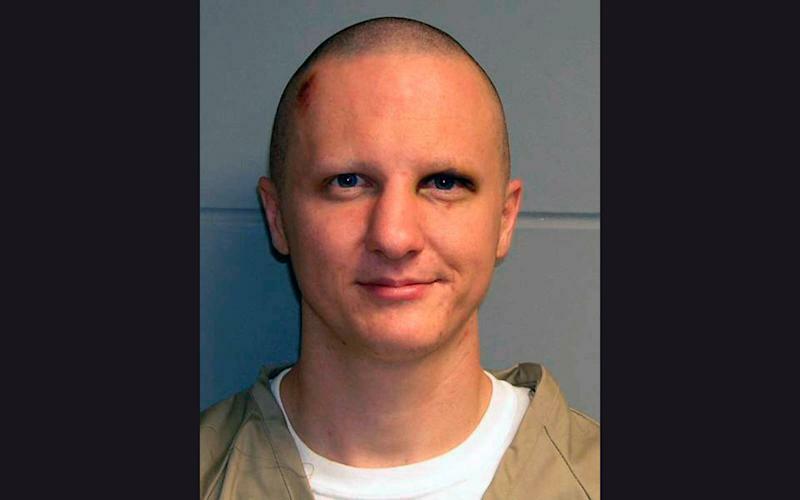 At the hearing, Loughner looked nothing like the smiling bald man with a bruise around his eye seen in the mug shot taken after the shooting. He had closely cropped brown hair and was wearing dress pants, shirt and tie. One by one, his victims had the chance to tell him how his actions immeasurably changed their lives. They approached the podium to address Loughner, and asked the judge if they could turn to face him. Loughner told the judge that he would not speak, and sat showing no visible emotion at a table with his attorneys. The last victim to approach the podium was Giffords, causing the courtroom to go quiet and somber. The couple had been sitting several rows behind the prosecutor's table, across the room from Loughner. As they sat in the courtroom, Kelly put his arm around her, and she would lean into him. When they made their way gingerly to the podium, the 42-year-old Giffords, dressed in black pants and a turquoise shirt, limped. Kelly held her arm and spoke to Loughner, who stared blankly at the couple. "Gabby would trade her own life to bring back any one of those you savagely murdered on that day," Kelly said. "Gabby works harder in one minute of an hour fighting to make each individual moment count for something than most of us work in an entire day." Kelly added: "Her life has been forever changed. Plans she had for our family and her career have been immeasurably altered. Every day is a continuous struggle to do those things she once was so good at." Kelly kissed Giffords when he was done. He grabbed her hand and helped her walk back to her seat. Susan Hileman, who was shot three times while trying to save her 9-year-old neighbor, shook as she spoke. "We've been told about your demons, about the illness that skewed your thinking," she said. "Your parents, your schools, your community, they all failed you. It's all true. It's not enough." Officials at Pima Community College had suspended Loughner over safety concerns after his classroom disruptions. They told him that if he wanted to return, he would have to get a mental health clearance. Loughner withdrew. The court-appointed psychologist who treated Loughner has warned that although Loughner was competent to plead guilty, he remained severely mentally ill and his condition could deteriorate under the stress of a trial. Authorities said they will return Loughner to the Missouri prison facility, but it's up to federal prison officials whether he will remain there. Legal experts had predicted that the only viable defense for Loughner was an insanity defense, given the number of witnesses and video surveillance footage. Still, Loughner never mounted such a defense. Burns said Loughner did not have an insanity case because the evidence indicated he was aware of his actions and knew they were wrong. In fact, the judge noted, an examination of Loughner's computer showed the 24-year-old had researched Giffords and the federal death penalty beforehand. "It would not have washed," the judge said. Loughner planned the attacks by getting a gun, high-capacity pistol magazine and ear plugs and lying in wait for Giffords at the grocery store, Burns said. Among those killed was another federal judge, John Roll. Mavy Stoddard, who was shot three times and cradled her dying husband, 76-year-old Dorwin Stoddard, in her arms as he lay bleeding after shielding her from gunfire, was among those who spoke to Loughner. "You took away my life, my love and my reason for living," Stoddard said. "I am so lonesome, hate living without him," she said, her voice cracking. Staring down at Loughner, she said, "we will never let you win. You will not take our spirit."